RCC is proud to announce that our commercial Tuggeranong Office Park project has received a Judges Commendation in the 2018 Master Builders Association Building Excellence Awards in the ACT. We share this excitement with our project partners FDC and Nettleton Tribe and our client, Cromwell Property Group who are all delighted to have the project recognized in the category of Commercial Buildings over $50 million. 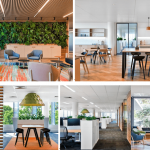 The 50,000m2 commercial facility in Tuggeranong (ACT) was completed in September 2017 and is now home to the Australian Government Department of Social Services (DSS).